Where does Joseph fit into Egyptian History? | Could Joseph and Imhotep have been the same person? Is Joseph likely to have figured in Egyptian records? Joseph would have had to construct massive grain silos for storing grain in many Egyptian cities and indeed, massive silos can be found in many historical significant Egyptian cities today (eg Saqqara). His family, the descendants of Jacob (Israel), produced mud bricks and became numerous in the 430 years that they lived in Egypt. The pyramids of the 12th dynasty contained millions of mudbricks. 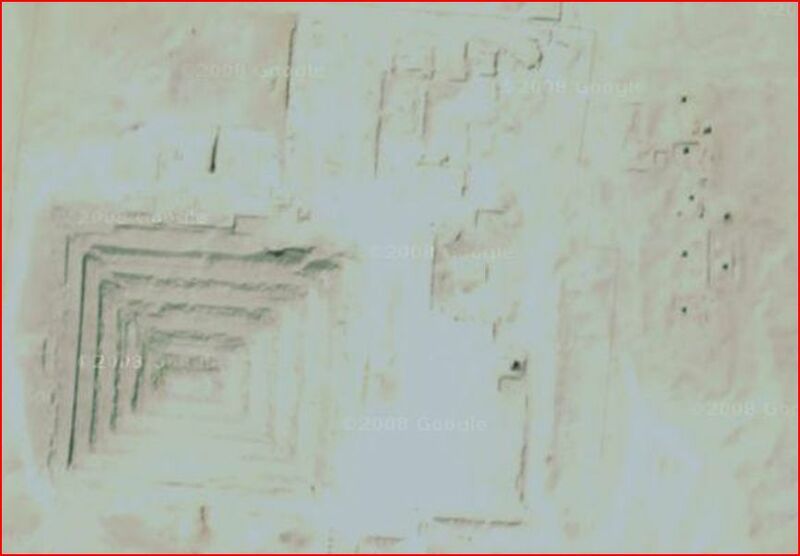 Seven such pyramids were built over a 200 year period ending with those of Amenemhet III who also built an enormous mudbrick structure called the Labyrinth. A large slave labour force was needed to build the 12th dynasty pyramids. It is likely that the Hebrew slaves produced the bricks that went into the 12th dynasty pyramids. After the Exodus in the 13th dynasty, no more great pyramids were built. Estimates of dates have long been the common denominator used by archaeologists and historians alike when trying to piece together ancient history. Various teams of archaeologist have used a number of different dating methods to estimate how old a particular artifact is. For example, the type of pottery that is predominant in a layer can be used to date the layer. As creationists have noted however, dating methods are highly unrealiable and cannot be trusted as authoritative, and certainly not where they contradict Scripture. Assumptions behind various dating techniques are not alway right. This can sometimes lead to artifacts being incorrectly dated by as much as 1000 to 2000 years. If history is pieced together based only upon the estimated dates of particular dynasties, the results can be quite erroneous and it will be little wonder why Egyptian and Hebrew history does not fit together and why no Egyptian equivalent of Joseph has been found using the dates traditionally ascribed to various Egyptian dynasties. An increasing number of historians are now calling into question the dates of Egyptian dynasties. In particular, Sweeney , Velikovski , Fry   , Reilly  Down . They have proposed revisions of the Egyptian timeline which generally contract the Egyptian time frame and bring the dates of the Egyptian dynasties forwards. The revised Egyptian dates when aligned with the Biblical dates suggest new candidates for Biblical figures which now need to be confirmed by Character matching and Archaeological discoveries. Using their revised dating systems, the historical records of Israel and Egypt fit together differently, purportedly making it possible to identify likely contemporaries of important Biblical Characters. 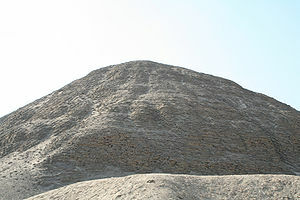 The Pyramid of Amenemhet III at Hawara (the 6th pharaoh of the 12th Dynasty of Egypt). Millions of large mudbricks went into the building of Amenemhet III’s second pyramid. It was originally faced with stone but it is now just a heap of mud bricks. The Bible records (Exodus 5:6-21) that when the Israelites were slaves in Egypt, Pharaoh forced them to make mudbricks reinforced with straw. However, the Bible does not say that the Israelites were required to make pyramids with them, and many other mudbrick structures exist in Egypt. 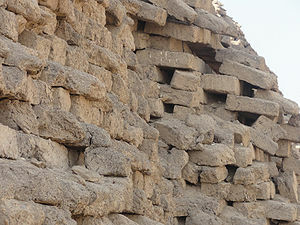 Mud bricks in the Amenemhet III pyramid at Hawara. The the exterior limestone facing (veneer) has fallen away due to erosion, earthquakes and pilfering over the centuries exposing the inner core of mudbricks. There is very little rain in this part of the world and so the mudbricks are in quite good condition considering their age. This was the last of the great pyramids to be built. Although there are many mud brick structures in Egypt, the pyramids of the 12th dynasty contain millions of mud bricks which, of necessity, would have required a very large slave labor force to produce. Josephus, a Jewish historian around the time of Christ, records that the Israelites were given the task of making Pyramids. Conventional wisdom which has been very reliant on the Biblical record and timeframes, has been unable to find any evidence that the Patriarchs of Israel lived in Egypt and have not found any possible candidates for Joseph because they are looking for evidence of him in the Hyksos dynasty which is estimated to have been around 1700BC according to conventional chronology. Many scholars have tried to place the Exodus in the 18th dynasty because of arguments related to when chariots were first introduced to Egypt. A lot of emphasis has been placed on this one point and seems to have sent many an archaeologist on a ‘wild goose chase’ looking for evidence of a mass exodus in the 18th dynasty (and of course they cannot find it because the Exodus took place in the 13th dynasty). Although hundreds of Chariot Wheels containing 4, 6 and 8 spokes have been found in the Red Sea at Nuweiba by Wyatt and others, these chariot wheels had been dated to the 15th dynasty or later and so the 12th dynasty was overlooked. The fact that no 12th dynasty chariots have been found should not be surprising as the Bible tells us that Egypt lost all of it’s army and chariots to the Red Sea at the time of the Exodus. Rather than looking for ‘Chariot Wheels’, we should be looking for lots of ‘mudbricks’ and what better place to look than the 12th dynasty. Mud bricks were used most prolifically in the 12th dynasty, not only for buildings like the Labyrinth, but also for the pyramids of the 12th dynasty. A revised chronology results in a very different picture with the history Israel and Egypt purportedly matching better with “archaeological” records, which of course are subject to interpretation. Abraham is then considered to be a contemporary of Menes. 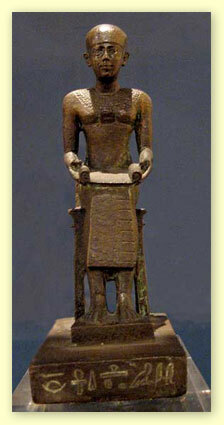 Imhotep is considered to be the Joseph of the Bible and Djoser is considered to be the Pharaoh that he served   . The Biblical dates before the Exodus are determined by whether one assumes a long or a short sojourn of Israel in Egypt. This is another confounding factor that can throw out the Biblical dates by as much as 200 yrs resulting in an incorrect alignment for events prior to the Exodus. « If Joseph was Imhotep of the 3rd dynasty and Moses was Amenemhet IV of the 12th dynsasty, where do David and Solomon fit in?